First of all you need to make a proper diet plan to burn excess fat around your belly. Eat more fresh fruits and vegetables, lean protein, low-fat dairy products and whole grains but reduce oily and junk foods. Eating the wrong foods can cause you to gain more tummy fat. Avoid alcohol, or sugary, fizzy carbonated drinks. Sweet and sugary drinks and beer can also cause you to gain more tummy fat. Eat fruits rich in Vitamin C because it helps a lot to burn excess fat around your stomach. Start your day by drinking a glass of lukewarm water on an empty stomach. You can add 1 tablespoon of fresh lemon juice and half teaspoon of honey to improve taste and effect. 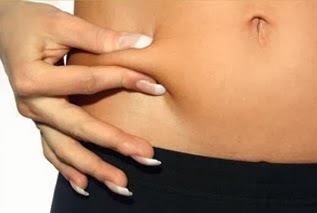 This home remedy is very effective to burn belly fat fast. For quick results drink this glass of lukewarm water added lemon+honey before every meal.It will make you feel full and prevents from over eating. Breast feeding is an other effective way to reduce belly size by contracting uterus and by contracting uterus to normal size. According to recent scientific search upon breast feeding mother, breast feeding can burn up to 500 calories a day. If you breastfeed, you'll burn extra calories to make milk. You may lose your pregnancy weight more quickly than mums who bottle-feed their babies.Breastfeeding also triggers contractions that help to shrink your uterus, making it a workout for your whole body. However, if you eat more than you burn off, you will put on weight, even if you breastfeed. Lactating mothers needs extra calories for milk production so don’t reduce calorie intakes drastically. Milk supply will reduce if you start dieting soon after giving birth as well as you feel more tired. Instead of dieting or skipping meals you should make a proper diet plan containing all essential nutrients, minerals and vitamins. Skin moisturizing massage helps a lot in improving blood circulation and elasticity in skin. If your skin is well hydrated and moisturized then it is less prone to suffer from stretch marks and sagging.You can prepare a mixture of Shea butter and lemon juice by mixing 4 teaspoons of Shea butter and 1 teaspoon of lemon juice. Apply over the affected areas and let it stay till it dries. Wash off with cool water and repeat the procedure regularly.Shea butter is a rich source of vitamin E and carotene which improves the elasticity of the skin and give your skin youthful appearance by rejuvenating skin cells. Lemon juice is a rich source of Vitamin C, which aids in collagen production and helps a lot to get back firm and healthy skin. Almond oil massage is also considered good for treatment of sagging skin because Almond oil has a high percentage of Vitamin E and a good antioxidant, that's why not only help to cure sagging skin but also help for removing , stretch marks, fine lines and wrinkles. A proper diet plan along with some light exercises works wonderfully in reducing, toning and firming your tummy after delivery. When you exercise your muscles, they take energy from your fat stores to complete the exercise. The more you exercise, the more your muscles take energy from the fat stored. To begin, perform light physical activity such as cycling, walking or swimming. Gradually increase the intensity of your workout. You can include also aerobic exercises such as jogging, dancing, biking, climbing stairs, and yoga stretches. Avoid excessive weight loss exercise which may further cause loose and sagging skin. Muscle building exercise like weight lifting create new muscle fibers and also help free hanging skin to attach with muscles and make you able to get back your healthy tight skin. Stomach crunches are the best way to tone and firm your saggy belly skin. Stomach or abdominal crunches can be performed in different ways, as there are several variations to them. You can start with a simple stomach crunch. Leg raise crunch and vacuum crunches help a lot to burn belly fat at home. i. If you had a complicated delivery, cesarean or C-section, allow your body to heal before jumping into an exercise routine. ii. If your delivery wasn't complicated, exercising within a few days of your delivery can be done with your physician's approval. 2.
iii. While firming your tummy patience is the key because It took nine months for your tummy muscles to stretch and increase size to accommodate a full-term baby. So it makes sense that it can take that long, or longer, to tighten up again.